Hundreds of students and local residents planted thousands of seedlings April 22 on vacant UC-owned agricultural land near Berkeley in what they called a peaceful, family-friendly “Occupy the Farm” action, borne out by this video of the action and these photos in the San Jose Mercury News. The Gill Tract is a 15-acre parcel that UC had used for agricultural research, and sits adjacent to a 58-acre complex of UC Berkeley family student housing. But the university plans to sell the land to developers, who have plans to build a senior center and a Whole Foods supermarket. 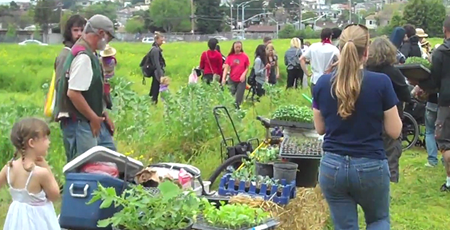 Berkeley students, local residents plant a garden on vacant UC land. Activists say it is the only large plot of “class one” agricultural land left in the east bay, and that students, professors and local residents have been advocating that it become an educational center on sustainable urban agriculture. UC Berkeley issued a statement calling the occupation illegal, but pledging to “reach out” to those involved. Pending state legislation to fund scholarships for middle-income California college students through eliminating tax breaks for corporations is meeting opposition from – guess who? – big corporations. The Daily Bruin reports that Chrysler, General Motors, International Paper, Kimberly-Clarke and Procter & Gamble are among the companies that have formed a coalition to oppose the Middle Class Scholarship Act, introduced by California House Speaker John Perez (D-Los Angeles) last February. Faculty at the California State University system began voting last week on a possible strike in the fall, according to the Los Angeles Times. The California Faculty Association, which represents 23,000 Cal State professors, lecturers, librarians and counselors, reports that the vote turnout was heavy: “Faculty don’t want to strike, but they will if that is what it takes to protect our system,” said Lillian Taiz, CFA President and a professor of History at Cal State Los Angeles. Results have not yet been released. San Francisco’s Fog City Journal reports that students in the 23-campus public system are also speaking out in support of the faculty issues. The AFL-CIO has released a new database and other resources on skyrocketing CEO pay. While it focuses on private-sector issues, most of us will see many similarities with the problem of UC’s rising executive pay described in this summary by San Francisco Chronicle journalist Tanya Schevitz. This year, UPTE members in California will be attending Workers' Memorial Day events in Oakland on April 27 (12–1:30) and in Los Angeles on April 28 (beginning at 10 am) to commemorate workers who have sufferend and died as a result of workplace injuries or diseases, and to renew efforts to ensure safe workplaces. Mobilizations have already begun internationally, culminating in Saturday events. This year's theme is "Safe jobs save lives."